CONVERSABLE ECONOMIST: Will Real Interest Rates Bounce Back? Back around 1983, I remember visiting friends in San Diego and making a day-trip over into Mexico. As we crossed the border, I remember billboards advertising that banks were paying an interest rate of 80% on deposits, which sounds like a good deal, unless you also happened to recognize that the interest rate was being paid in Mexican pesos, and Mexican inflation at that time was spiking over 100%. The real interest rate--the nominal rate minus inflation--was negative. The world economy has been going through a period with extremely low real interest rates in the last few years, and the IMF examines the causes and likely future patterns in Chapter 3 of the most recent World Economic Outlook report: "Perspectives on Global Real Interest Rates." 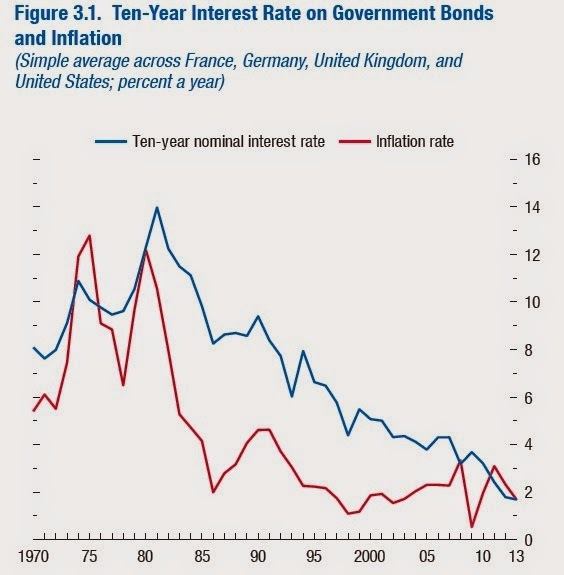 Here's a figure to get a sense of real interest rates in the last few decades. The blue line shows the nominal interest rate paid on 10-year government bonds: it's an average for the United States, Germany, France, and the United Kingdom. The red line shows average annual inflation across these countries. The spike in global inflation in the 1970s meant that real interest rates were near-zero for a few years. But after inflation dropped in the mid-1980s, real interest rates were positive until the global financial crisis; for example, around 2000 real interest rates were typically in the range of 3-4%. But in the aftermath of the global financial crisis, real interest rates have been near-zero. What factors explain this change, and are real interest rates likely to bounce back in the near future? As the figure shows (if you squint just a bit), the drop in real interest rates is not purely an effect from the Great Recession. The inflation rate has been more-or-less the same at about 2% per year since the early 1990s, but the nominal interest rate on 10-year government bonds has been in steady decline--which together imply a falling real interest rate over time. 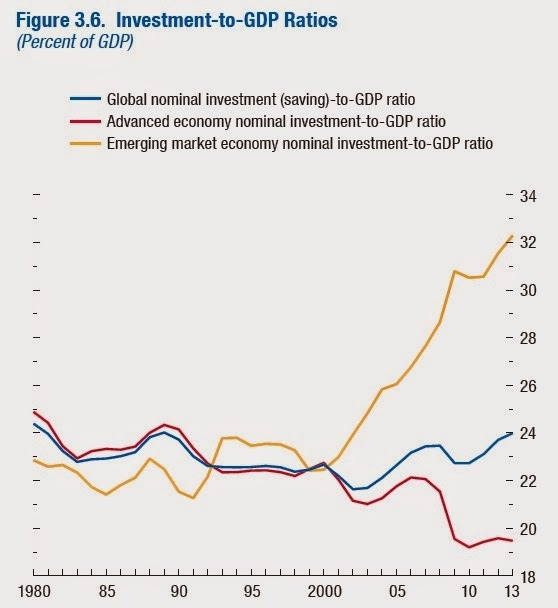 On the demand or investment side, global investment relative to GDP has stayed relatively constant over time, but the ratio has risen sharply since 2000 for emerging market economies while falling in advanced economies. Of course, this change has implications for where growth will occur in the future. The IMF suggests that investment levels in advanced economies are not likely to recover to pre-crisis levels for the next five years, so there is unlikely to be a surge of demand for borrowing from this area that would drive up real interest rates. On the supply side, the global economy has seen more saving along with portfolio shifts that lead more of that saving to be invested in safe assets like government bonds : "A large increase in the emerging market economy saving rate between 2000 and 2007 more than offset a reduction in advanced economy public saving rates. ... Portfolio shifts in the 2000s in favor of bonds were due to higher demand for safe assets, mostly from the official sector in emerging market economies, and to an increase in the riskiness of equity relative to that of bonds. These shifts led to an increase in the real required return on equity and a decline in real rates—that is, an increase in the equity premium." 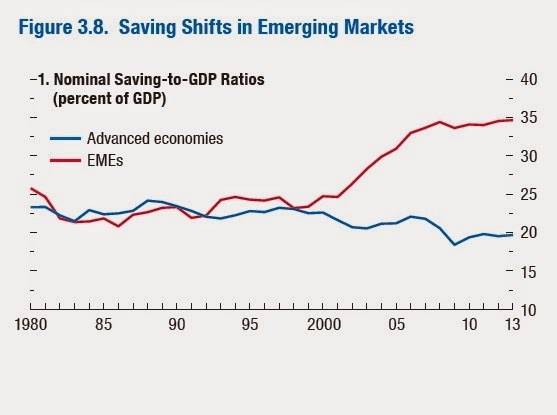 Here's a figure showing the rise in savings rates relative to GDP in emerging markets. 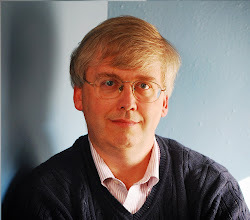 Finally, monetary policy can of course affect interest rates, inflation, and the gap between them; indeed, the IMF argues that the story of real interest rates in the 1970s and 1980s is largely about monetary policy. But at least in the next few years, it seems unlikely that central banks will seek to push up real interest rates. Thus, the overall prediction is that investment in advanced economies will rise a bit, and the savings rate in emerging economies will sag a bit, but the rise in real interest rates will be muted for the next few years. As the IMF writes: "In summary, real [interest] rates are expected to rise. However, there are no compelling reasons to believe in a quick return to the average level observed during the mid- 2000s (that is, about 2 percent)."